SeeItOnTheNet is an advertising display website. Here you can advertise your property and also get it listed on the big search engines like Google, Yahoo!, Bing, AOL, and Ask, dramatically improving the marketing of your property on the Internet to give you a quicker sale or lets. 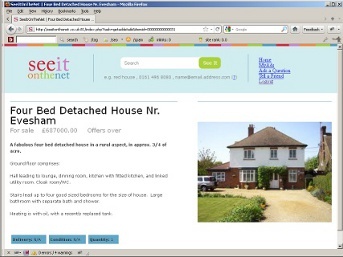 With SeeItOnTheNet you don't just get better marketing you also get 0% commission when selling or letting . So what you get is a great free advertising platform to advertise on, and all you need to do is write your advert and make sure you have all the legally required documents by the time you sell or let it. If your not sure on the legal stuff when selling a house look here, and for letting look here. These website will explain your legal responsibilities when selling or letting your property. Making your first property advert is simple, there's a one minute registation before writing your first advert and upload a picture all in less than five minutes. You can see how your ad will look in the example listing on the left, its clear, clean and easy for prospective clients to read. And so that you don't get spammed we've builtin an email link so interested clients can quickly contact you for more information without exposing your phone number or email address to spammers.